Check out this Q & A session with the Drillers Pitching Coach Dave Schuler. He discusses his approach to coaching, his teaching methods and how his experience helps him relate to the pitchers on his staff. Thanks for joining us once again. In parts one and two of our fantasy baseball analysis, we successfully assembled a 12-man roster using only former Tulsa Drillers. Unfortunately, the team was not a winner. But looking beyond our roster, let’s examine six more Drillers alumni who can make solid contributions to our roster or make their first big splash at the big-league level in 2012. 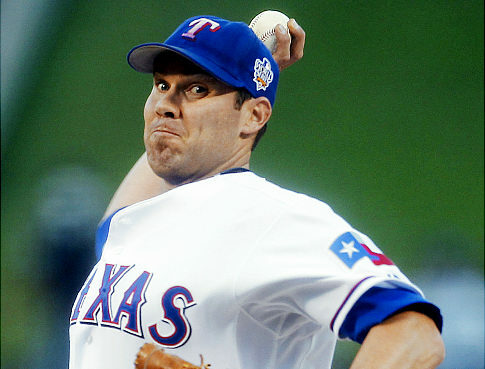 #1: Colby Lewis, SP, Rangers. The first-round pick in 1999 made 25 starts for the 2001 Drillers, going 10-10 with a 4.50 ERA. While he struggled with control, Lewis posted 162 strikeouts in 156 innings. Baseball America ranked him the 82nd-best prospect prior to the 2002 season. Fast-forward six years, and after bouncing around three MLB organizations, Colby Lewis signed a two-year agreement with Japan’s Hiroshima Carp in 2008. There, he would hit his stride, posting a 26-17 record with a sub-3.00 ERA in 54 total starts. Remarkably, control issues disappeared as Lewis walked a minuscule 46 batters in 254.1 innings, striking out 369. Those mind-boggling numbers in Japan motivated the Rangers to gamble on Lewis with a two-year deal, including an option for 2012. Lewis made good on the gamble with two years of 200+ innings and 32 starts. Bad luck hit Lewis in 2011 as his ERA ballooned to 4.40, but his peripherals again indicated solid control and a good walk-to-strikeout ratio. We can do a lot worse in Round 18. Our Guess: 14-11, 3.91 ERA, 1.19 WHIP, 182 K.
#2: Drew Pomeranz, SP, Rockies. Fun fact: Brothers Stu and Drew Pomeranz pitched for the Drillers in consecutive years – Stu pitched out of the bullpen in 2010 and Drew made two starts in 2011. We should ask @BarryLewisTW how many other teams can say that. Drew Pomeranz, the key prospect in the deadline swap that sent Ubaldo Jimenez to Cleveland, made one start before hitting the DL with an emergency appendectomy. He made one more start for Tulsa in September before advancing to Colorado. He dazzled with 10 scoreless innings for Tulsa, allowing two hits while striking out seven. In Colorado, Pomeranz struggled to a 5.40 ERA but showed promise with 13 strikeouts compared to only five walks in 18.1 innings. Remove one bad start in Houston and we see a much different line: 2-0, 2.75 ERA, 0.98 WHIP, 4 BB, 10 K. We’re nitpicking here, but this shows the 23-year-old left-hander will have growing pains amid flashes of brilliance. Also, buyer beware; Pomeranz has only pitched 119.1 innings in his young professional career. We think he’s the favorite to land in the middle of their 2012 rotation, but that role likely comes with an innings limit – a safe guess is about 150 innings. Pomeranz’s walks-per-nine rate has dropped from college to the minors and again in the majors. And while his control and strikeout power provide some upside, we’re going to preach patience with him this season. Pomeranz is a good play in weak match-ups, but be ready to stream him when his cold streaks inevitably come. Our Guess: 8-10, 4.51 ERA, 1.31 WHIP, 118 K.
#3: Travis Hafner, DH, Indians. Believe it or not, “Pronk” began his career in Texas and played for the Drillers in 2001. Smashing 20 home runs with 24 doubles and 74 runs batted in, Travis Hafner appeared a legitimate power threat at first base. Equally impressive was Hafner’s plate discipline as he posted a .396 on-base percentage. After making his Rangers debut in 2002, he was traded to the Cleveland Indians in a four-player deal where he excelled at first base and DH. 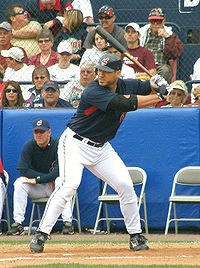 In 2011, however, Hafner hit the DL twice, making five trips in the last four seasons. He still managed double-digit home runs and modest run production, but the risk of Hafner being a part-time player remains high. At the very least, Hafner is a decent play during a hot streak; dump him when, not if, he gets hurt. Our Guess: 39 R, 13 HR, 45 RBI, .276 AVG. #4: Juan Nicasio, SP, Rockies. There’s a lot of upside with Nicasio heading into 2012, but we’re still unsure how to gauge his health after his freak injury last season. Reports out of Spring Training mention Nicasio hitting 97 mph with his fastball (a plus pitch that sat at 94-95 mph in Tulsa) and showing “full recovery.” While we hope Nicasio excels in the Rockies rotation, we think it’s best to tread lightly. 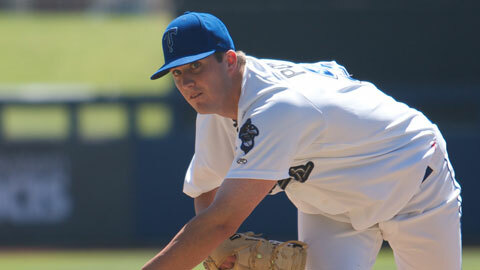 The Drillers’ 2011 Opening Day starter dominated in Tulsa. Across nine starts, he sported a 5-1 record with a 2.22 ERA and 63 strikeouts in 56.2 innings; he quickly earned a call-up to the Rockies on May 28. Nicasio has approached 180 IP only once – his breakout 2010 campaign in Modesto. So a 160-inning limit makes sense regardless of the injury. By comparison, he has more minor-league seasoning than Drew Pomeranz, but Nicasio’s poise and “stuff” are more major league-ready, leading us to believe he’ll quietly have the better year. Our Guess: 9-6, 3.98 ERA, 1.27 WHIP, 139 K.
#5: Charlie Blackmon, OF, Rockies. Charlie Blackmon made his Drillers debut in 2010, one that inspired his own cheer (“Charlie” instead of “Charge”). The 2008 second-round pick raked in 86 games with 100 hits, 11 home runs, 53 runs, and 55 driven in. He also swiped 19 bases, showing athleticism and a gritty playing style. Blackmon debuted with the Rockies in June with Dexter Fowler on the disabled list; after a string of multi-hit games and a stolen base in five straight, he finished with a modest .255 in 27 games before a fractured left foot ended his season. Blackmon will likely make the team as a fourth outfielder in 2012 while guys like Tim Wheeler wait patiently at Colorado Springs. Unfortunately, a healthy Carlos Gonzalez, Fowler, and Michael Cuddyer will severely limit his at-bats. He may have to sit unless injuries occur. Or, he can play right field on occasion whenever plays first or third base. Our Guess: 21 R, 4 HR, 13 RBI, 7 SB, .280 AVG. #6: Ian Stewart, 3B, Cubs. The Rockies traded Stewart and RHP Casey Weathers, two former first-round picks, to the Cubs for D.J. Lemahieu and Tyler Colvin this off-season. Weathers has a shot at making the Cubs’ bullpen and Stewart is the favorite at third base. 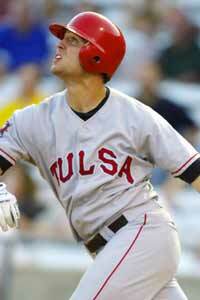 Stewart played 120 games at Tulsa’s hot corner in 2006 and hit .268 with only 10 home runs. But 41 doubles, seven triples, and 71 runs batted in suggest he may have simply been unlucky. He posted a career-best 25 home runs with Colorado in 2009, but his performance took a dive ever since, culminating in an abysmal 2011 (.156, 0 HR, 6 RBI) and a demotion to Triple-A. As Stewart gets a fresh start in Chicago, can we expect much in a bounce-back season? A low contact rate and a career 27.9% strikeout rate in parts of five seasons suggest we should makee conservative projections. But perhaps the change of scenery will help Stewart rediscover the power stroke that tantalized scouts in his days as a prospect. Cubs hitting coach Rudy Jaramillo is talented, but this will challenge him. Stewart makes a decent play for your corner infield slot (CI) in NL-Only leagues, but we’re still not convinced Stewart is a sleeper until we see him get back on track. A full, healthy season with the Cubs would be a good start. We have faith in you, Stewie. Our Guess: 43 R, 15 HR, 57 RBI, 4 SB, .234 AVG. That’s it for the 2012 Tulsa Drillers draft analysis. Did we forget anyone? Which former Drillers do you think will make a significant impact in 2012? Do you think you can draft a better team than we did? Let us know – hit us up on Facebook or Twitter. Welcome to part two of our 2012 fantasy baseball challenge. If you recall, we posed the question to our fans: Can we build a competitive fantasy baseball team composed entirely of former Tulsa Drillers players? We continue our analysis here as we list the final six members of our roster. DID YOU KNOW: Two of our first six players are former first-round draft picks (Troy Tulowitzki, 2007; Mark Teixeira, 2001). First six picks: SS T. Tulowitzki; 1B M. Teixiera; OF M. Holliday; P C.J. Wilson; 3B M. Young; P U. Jimenez. #7, Round 16: Carlos Pena, 1B/DH, Rays. After bouncing around the majors, Peña found a home with the 2007 Rays. 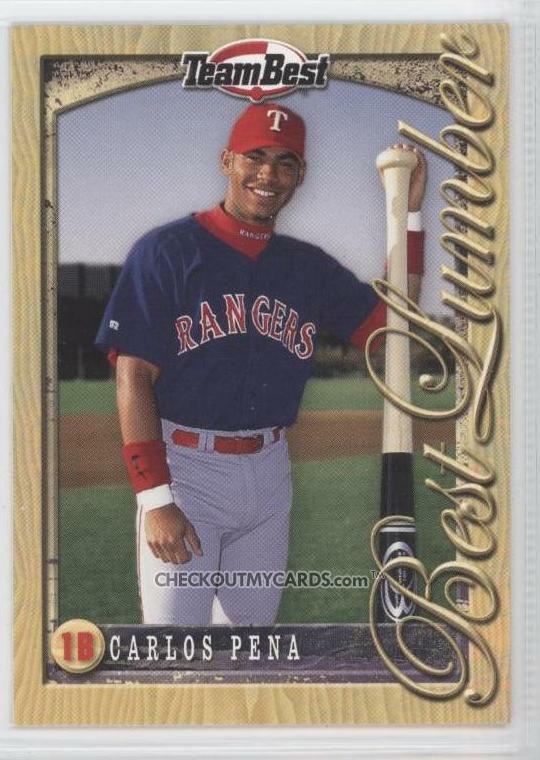 46 home runs, 121 runs batted in, and a staggering 1.037 OPS set franchise records in the process and Peña was named 2007’s AL Comeback Player of the Year. His average has dropped dramatically since, but his power remains. A return to Tampa in 2012 means 450+ at-bats at 1B, which will provide good power in later rounds of our draft at the expense of batting average. Our Guess: 73 R, 28 HR, 86 RBI, 2 SB, .231 AVG. #8, Round 19: Jhoulys Chacin, SP, Rockies. Jhoulys Chacin made 18 starts for Tulsa in 2009, going 8-6 with a 3.14 ERA and 86 strikeouts before a trip to Triple-A Colorado Springs. He earned a #46 ranking in Baseball America’s Top-100 Prospects list. Chacin then put together two solid seasons in Colorado, managing a mid-3 ERA with 288 total strikeouts in 331.1 innings. By comparison, he looked more hittable last year; His terrifying slider seemed less terrifying, and his strikeouts-per-nine-innings rate dipped below 7. But we predict a breakthrough is on the horizon for the 24-year-old. Refining and using a changeup more might help leverage his slider as a strikeout pitch once again. His potential as a 200-inning workhorse is there, and we think he has yet to show his front-of-the-rotation talents to their fullest extent. The Rockies’ recent acquisition of Jeremy Guthrie pushes Chacin back down to the #2 spot in the rotation, taking some of the burden off his shoulders as he continues to refine his craft. Round-19 value for Chacin means he is a diamond in the rough for our roster. Our “Bold” Guess: 12-11, 3.58 ERA, 1.24 WHIP, 177 K.
#9, Round 21: Dexter Fowler, OF, Rockies. 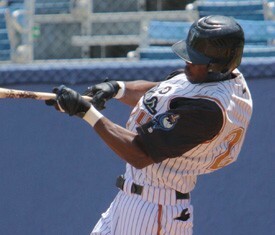 In 2008, Dexter Fowler amassed 141 hits in 108 total games for Tulsa. A pure hitter, he scored 94 times, stole 20 bases, and dominated with a .335 average. Fowler looked the part of the center fielder the Rockies craved atop their now-potent lineup and, in some ways, still shows that talent. Fowler sported a .363 on-base percentage in 2011 but only hit .266, looking timid at times in stolen base opportunities. We think that will change in 2012 as he takes the lead-off rolein the Rockies lineup. With the addition of Marco Scutaro, the first five hitters appear to be Fowler, Scutaro, Tulowitzki, Gonzalez, and Cuddyer – i.e. plenty of opportunities for Fowler to score. Simply put, he can get on base, hit and run well, and score plenty of runs for us in a very late draft round. With some upside attached, he’s a bargain. Our Guess: 96 R, 8 HR, 56 RBI, 34 SB, .276 AVG. 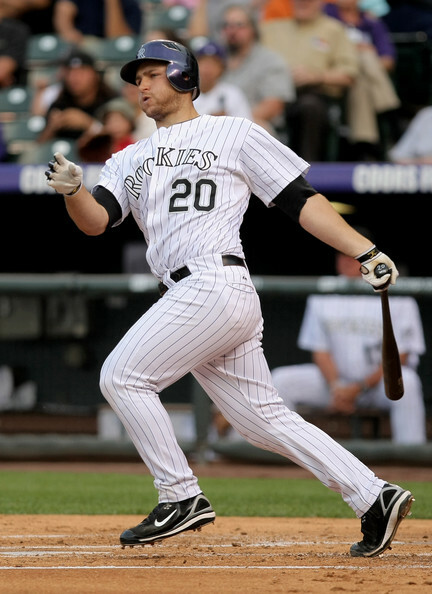 #10, last round: Chris Iannetta, C, Angels. **Sleeper Pick: Wilin Rosario, C, Rockies. 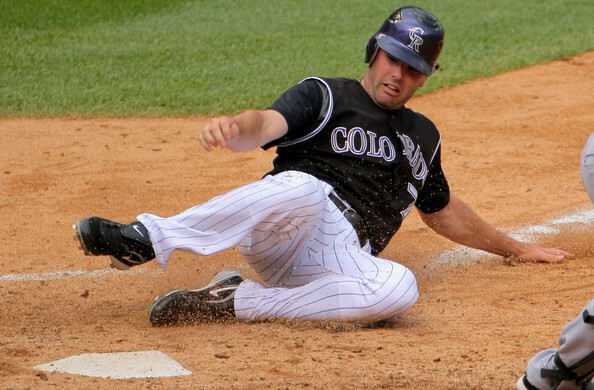 As of February 2012, the only former Driller with a full-time catching gig is Chris Iannetta. He played a total 63 games for Tulsa in late 2005 and early 2006, swatting 13 home runs, driving in 37 runs, and scoring 45. He hit a combined .296 in Tulsa but has only managed to hit .235 in his major league career. In 2011, he hit .238 and a career-worst .172 on the road; he only hit 14 home runs and drove in 55 runs in a career-high 112 games. Iannetta now appears in a potent lineup headlined by Albert Pujols, but we have modest expectations for the 28-year-old in 2012. Our Guess: 42 R, 14 HR, 53 RBI, 5 SB, .236 AVG. The more intriguing option is recent alumnus, 23-year-old Wilin Rosario. He set career highs in his second season with Tulsa – 101 hits, 21 home runs, and 52 runs scored in 102 games – but his plate discipline regressed, resulting in a .249 clip and career-low .284 on-base percentage. His struggles at the plate continued in a September call-up. Rosario hit .204 with three HR in 16 games, striking out 20 times in 54 at-bats. Rosario might end up being the back-up to veteran Ramon Hernandez at the MLB level, but it’s anyone’s guess how much playing time that situation will allow. As an injury replacement or a young catcher-in-transition, the Rockies may give Rosario a lot of rope, which we think means a lot of power, a lot of strikeouts, and a low average. Think J.P. Arencibia of the Blue Jays, circa 2011. But don’t be surprised if Rosario sees time in Triple-A Colorado Springs to address those strikeout issues we saw at the end of last season. Pay attention and be ready to pick him up on free agency when he gets hot. #11, last round: Seth Smith, OF, Athletics. 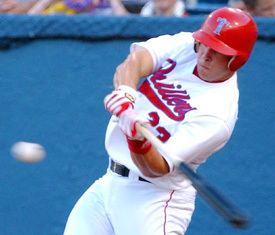 Seth Smith played all over the outfield for Tulsa in 2006, hitting .294 with strong power numbers – 46 doubles, 15 home runs, and 71 runs batted in. In three seasons with the Rockies, however, he failed to improve on them and eclipse the 20-HR plateau. In 2011, Smith again faltered against left-handed pitching and hit only .248 on the road for Colorado. The team felt it was time to cut ties with the former first-rounder, and he was traded to Oakland this off-season in exchange for two pitchers. Unfortunately, we’ve probably seen the best of Smith’s playing abilities by now. And if history serves us correctly, the 29-year-old is due for a big regression without Coors Field to pad his stat line. Just think of Matt Holliday in Oakland circa 2009, when he looked mortal. The 29-year-old Smith looks primed for a similar drop-off, meaning we should expect less, not the potential for more. Our Guess: 39 R, 12 HR, 46 RBI, 6 SB, .254 AVG. #12, last round: Eric Young Jr., 2B, Rockies. As of March 2012, no former Driller has a starting 2B job. And with the Rockies’ acquisition of Marco Scutaro, it seems they are content with a veteran as utilitymen like Eric Young Jr. continue to develop. In 2008, second baseman Eric Young Jr. scored 74 runs and stole 46 bases in 105 games, again showing the near-elite speed that has wowed scouts. He was only successful in 74% of his stolen base attempts in ’08. By 2011, however, his success rate shot up to 90%, going a combined 44-for-49 in stolen base attempts. Young might still put up 25-SB speed in a part-time role with the Rockies in ’12 but the playing time will be sparse. Our Guess: It’s too early to tell. The Mets reportedly have an interest in Young, but the Rockies currently have EY2 as a bench player alongside Chris Nelson and Jonathan Herrera. Until we see guaranteed playing time, it is dire straits for our fantasy team. 2B – Eric Young, Jr.
With serious questions at catcher, second base and the outfield, there’s a sufficient lack of production in our lineup. Plus, no former Drillers appear in the closer role with any major league team, giving us goose-egg in the saves category. This team is not a winner, but it’s still cool to see Drillers alumni contribute at the major-league level with some of them among the top options at their positions. In part three of our analysis, we will examine a short list of former Drillers (veterans and rookies) who can make solid contributions to our roster in 2012. These won’t be players you pick and stash on your bench from Day One. Rather, these are the former Drillers who will appear on your league’s waiver wire and provide a mid- or late-season stat boost. Stay tuned. Spring training has begun; preparations for the season are underway. We brothers of the fantasy baseball fraternity now craft our draft strategies (Who should be off the board after round 1; when should we take our first closer?) We scrutinize over the value of players based on their current team, position, and even their age. What if we tried building our own competitive fantasy team, drafting all former Tulsa Drillers players? Can it be done with success? But what other factors influence our decision? Consider “the homer,” i. e. the person who drafts guys from the hometown team. What if we tried building our own competitive fantasy team with all former Drillers? This task comes with two restrictions. First, our players all must be former Drillers. Guys like Alex White, who threw for Tulsa in 2011 while on a rehab assignment with the Rockies, don’t count. Second, we must pick the player with the best stats at each position. Two former Drillers might play 1B, but we’re only drafting the better of the two. #1, Round 1: Troy Tulowitzki, SS, Rockies. This is a no-brainer as Troy Tulowitzki ranks annually among the top three options at shortstop. 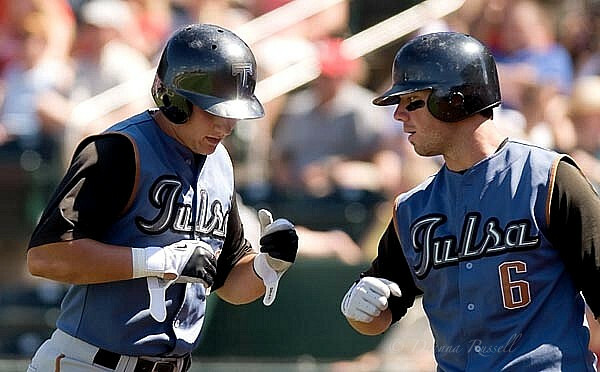 “Tulo” wowed Drillers fans in 2006, hitting.291 average with 13 home runs, scoring 75 runs and driving in 61 more. Tulowitzki debuted with the Rockies in 2007 and has been a perennial All-Star and MVP candidate ever since. He plays hard, but the injury risk is worthwhile given his elite production with the bat and the glove. We see Tulo repeating as arguably the number-one shortstop option in fantasy baseball this year. Draft him in full confidence among the first six or seven players off the board. Our Guess: 90 R, 30 HR, 98 RBI, 11 SB, .299 AVG. #2, Round 2: Mark Teixeira, 1B, Yankees. First base is a position very deep in talent, and 2012 is no different. This year’s crop is top-heavy with three or even four of the best 1B options coming off the board in the first round. Mark Teixeira ranks #6 in that group and earns a second-round tag as one of baseball’s elite power hitters. Teix played 48 games with Tulsa at the end of the 2002 season, hitting .316 in 171 at-bats and tallying 54 hits, 10 home runs, and 28 runs batted in. He carried the Drillers in their hunt for a Texas League Championship in the final year of the Drillers’ affiliation with the Texas Rangers. Teixeira is fresh off of his second 39-HR season in three years, tops among 1Bs in 2011. His batting average took a hit for the second year in a row (.248), but the elite power production plus a potent Yankees lineup keep Teixeira near the top of the 1B class. Our Guess: 98 R, 36 HR, 112 RBI, 3 SB, .260 AVG. #3, Round 3: Matt Holliday, OF, Cardinals. Outfielder Matt Holliday played 135 games with the Drillers in 2003, flashing power and speed with 28 doubles, 12 home runs, 72 runs batted in, and 15 stolen bases. But that was just the beginning for the Stillwater, Oklahoma native. Holliday posted an MVP-caliber 2007 with a .340 average and 137 runs batted in to pace the National League. Several years and two teams later, Holliday enters 2012 as the anchor in a sans-Pujols Cardinal lineup. Guys like David Freese, Carlos Beltran, and a rejuvenated Lance Berkman will provide plenty of run production, however; so draft Holliday with confidence knowing he’s a top-ten outfield option. Our Guess: 94 R, 28 HR, 102 RBI, 6 SB, .303 AVG. #4, Round 6: C.J. Wilson, SP, Angels. C.J. 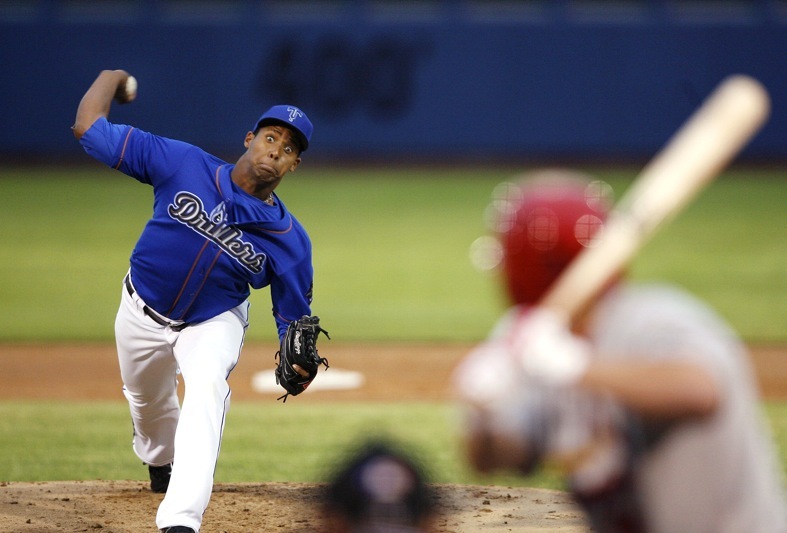 Wilson barely makes the cut as a former Driller, making only five starts in late 2002. The 21-year-old sported a 1.80 ERA across 30 innings, striking out 17. His first five seasons in Texas would bring about inconsistency and questions about his bloated walk rate. But a move to the starting rotation would prompt a significant leap forward. Wilson’s five-pitch arsenal with three plus offerings – a fastball, changeup, and a cutter – would move him into the upper tiers among American League starters. Wilson reached the 200-inning plateau in back-to-back seasons, twice boasting high strikeout numbers and solid peripherals. After a 16-7 season with the Rangers, featuring a 2.94 ERA and 206 strikeouts, he remains a solid pitching option for ’12 as he joins the Angels. Good run support and a stingy bullpen will help the former Driller feel right at home. Draft Wilson with confidence. Our Guess: 16-8, 3.20 ERA, 1.23 WHIP, 206 K.
#5, Round 9: Michael Young, DH/1B/3B, Rangers. 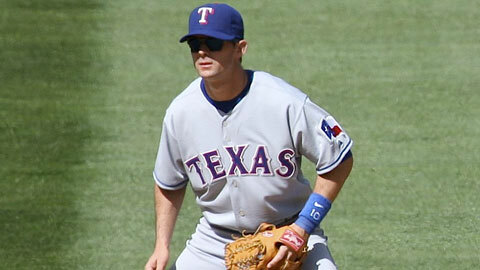 Michael Young is a DH, but he filled in as a corner infielder following injuries to his teammates in 2011. Fortunately for us, he played enough games at 1B and 3B to quality at each for the 2012 season; and with the dearth of talent at third base, it would be wise for us to slot him there on our roster. Young made the most of a 43-game stint with Tulsa in 2000, racking up 60 hits, scoring 30 runs, driving in 32 more, and hitting a robust .319 with nine stolen bases. The .296-lifetime hitter in the minors soared again in 2011 as, arguably, the Rangers’ most valuable player. Young turned in his sixth-career 200-hit season with a career-best .338 average and drove in 106 runs. In fantasy, he finished tenth among 3B-eligible players. Young may not have another renaissance year in 2012, but his hitting skills are still present, making him a quality play at third. Our Guess: 82 R, 14 HR, 96 RBI, 5 SB, .309 AVG. 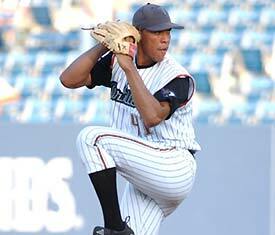 #6, Round 9: Ubaldo Jimenez, SP, Indians. 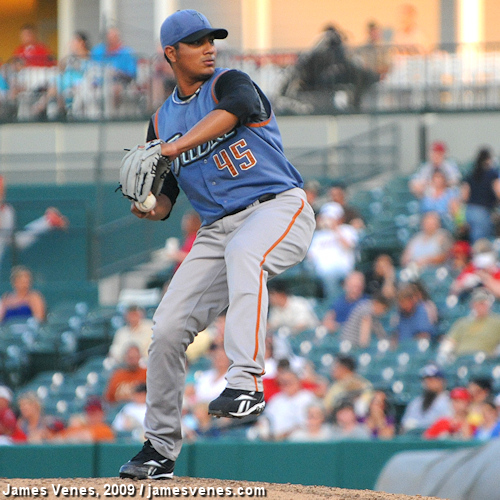 Ubaldo Jimenez had control issues in his first stint with Tulsa in 2005, sporting a 5.43 ERA in 63 innings with a 1.41 WHIP and 53 strikeouts. In a second tour, he looked much improved: a 2.45 ERA and 1.21 WHIP in 13 starts with 86 strikeouts. Jimenez then began a solid major league career with the Rockies. A 19-win 2010 campaign with 214 K and a 2.88 ERA led to a third-place finish in the NL Cy Young voting. 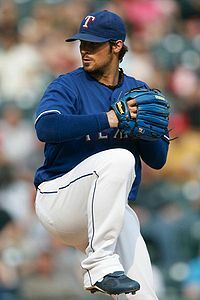 His 2011 season began with a dip in velocity and diminished control, fueling rumors that Jimenez was injured. And on July 31, 2011, a struggling Colorado shipped Jimenez to Cleveland, where he did not fare much better. His peripherals suggest that he was and is still the same pitcher, meaning 2011 spoke more to fatigue and bad luck than to injury. Jimenez is a strong bounce-back candidate in 2012. A pitcher-friendly Progressive Field and weak-hitting AL Central (save for Detroit) will make Jimenez a steal in round 9 of your draft. This is a worthwhile risk to take. Our Guess: 15-9, 3.43 ERA, 1.22 WHIP, 208 K.
We have now drafted the first six players of our 12-man roster, and I must say things are looking up. But be warned: murky waters lie ahead. In Part Two, we’ll draft the final six and analyze our roster. Stay tuned for more. 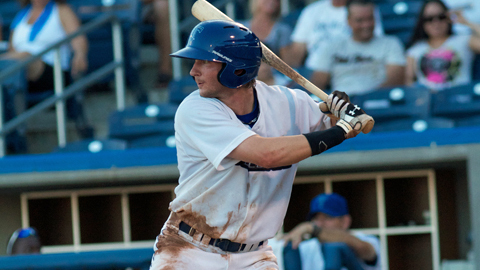 Hornsby made Valentine’s Day a memorable one for a number of Drillers fans last week. Our big blue Cupid delivered Valentine’s Day gifts all over the Tulsa metro area. Gifts included a dozen long-stem roses and a pair of Field Reserve tickets to both Opening Night (April 12) and the 2012 Texas League All-Star Game at ONEOK Field (June 28). Hornsby surprised unsuspecting individuals at home and at work from Chouteau to Bixby with roses, tickets, a bull hug, and a big smooch. “People were very surprised and some even a bit embarrassed when they realized Hornsby was there to deliver flowers to them,” said Game Entertainment Manager Justin Gorski. What made his deliveries extra special were the mini photo shoots Hornsby had with everyone. Check out a few slideshows from Hornsby’s deliveries here, here, and here. Hornsby delivered a whopping 31 gifts in all on Monday, Tuesday and Wednesday, but those weren’t nearly enough to fulfill all the requests he received. This one-of-a-kind offer sold out within five days; 18 deliveries were scheduled within the first 48 hours this offer was available. Travel and time constraints limited the number of visits Hornsby made during his three-day road trip. But changes are in place for Valentine’s Day 2013 that will accommodate the high demand for our blue buddy. Follow Hornsby on Twitter @TheRealHornsby. Pre-season ticket plans are still available. Call (918) 744-5901 or visit us online to find out more. With baseball season quickly approaching, the Tulsa Drillers held the final round of their national anthem auditions on Saturday, February 11. The Drillers’ anthem search resulted in more than 150 video submissions from all over Oklahoma and even as far away as Nashville, Tennessee. The top 50 candidates from the video submissions were invited to perform live for an esteemed panel of judges, which included Steven Tyler (Justin Gorski), J.Lo (Lynda Davis), Simon Cowell (Mike Taranto) and Randy Jackson (Brian Nhira). The auditions were conducted at ONEOK Field in the Conference Center. The room was divided in half – on one side contestants performed for the judges using a live microphone, while the other half of the room was filled with anxious singers. The tension in the “waiting room” was high, resembling a scene from backstage at the Grammys. Each time someone finished their audition the awaiting applicants cheered and applauded the effort. “What was great was how supportive all the contestants were of each other,” said Drillers Game Entertainment Manager Justin Gorski. What made the auditions particularly interesting was how talented and diverse the applicant pool was, with the youngest performer being a 12-year-old boy and the most “mature” contestant being a gentleman in his 60’s. The 50 finalists presented a wide variety of musical talents, among them were solo singers, duets, quartets and even a 9-person ensemble. The most unique renditions were from a trumpet player and a whistler. Drillers’ fans are in for an exciting season with terrific performers helping to start the games off right, said Gorski, after being impressed by the finalists. The winners will be announced in March. Be sure to arrive a little early to Drillers games this season to hear just how talented these national anthem performers are! The Texas League has named it 2011 End of Season All-Star Team and the Tulsa Drillers are well represented. Outfielder Tim Wheeler, catcher Wilin Rosario and second baseman Tommy Field were all elected to the elite squad that is determined through voting by league managers and media members. With three All-Stars, Tulsa matched Arkansas, San Antonio and Springfield for the most players on the 18-man team. Wheeler currently leads the TL in home runs, a spot that he has occupied for much of the season. But, the outfielder has done more than hit homers this season. Entering the final week of the season, Wheeler is hitting .291 with 85 runs batted in. He was leading the league with 154 hits, 66 extra-base hits and 101 runs scored, while also stealing 19 bases and picking up 13 assists from his centerfield position. Like Wheeler, Rosario and Field have enjoyed well-rounded seasons. Field is hitting .278 with 17 homers and 60 runs batted in. Defensively, he has made only eight errors and leads on TL second baseman with a .982 fielding percentage. Field has been involved in 71 doubles plays, nearly 20 more than any other second baseman in the league. Rosario entered the final week with a .250 batting average, 19 homers and 40 runs batted in. Behind the plate, he leads all TL catchers with a .992 fielding percentage. Rosario has thrown out 37% of attempted base stealers this season, the second highest mark in the league. Springfield’s Matt Adams edged Wheeler for the Texas League Player of the Year Award, while Arkansas’ Matt Shoemaker, who could win the league’s pitching triple crown, was chosen as the Pitcher of the Year. Former Oklahoma State University standout Doug Dascenzo was named the Manager of the Year for leading San Antonio to the best record in the league. The Missions will likely become the first Texas League team in 50 years to reach 90 total wins. Amarillo last accomplished the feat in 1961. Corpus Christi’s hitting coach, John Moses, was named the recipient of the Mike Coolbaugh Coach of the Year Award. Coolbaugh is the former Drillers hitting coach that was tragically killed in a game against Arkansas during the 2007 season. The complete Texas League End of Season All-Star Team is below. 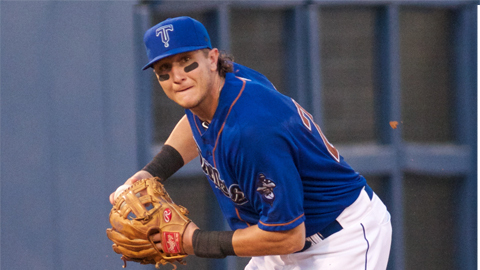 For the third time this season, Tulsa Drillers outfielder Tim Wheeler has been named the Texas League’s Hitter of the Week. The award was based on performances for the period of August 22-28. Wheeler hit safely in six of Tulsa’s seven games this past week. Overall, he was 12-31 (.387) with 2 doubles, 3 homers and 6 runs batted in. 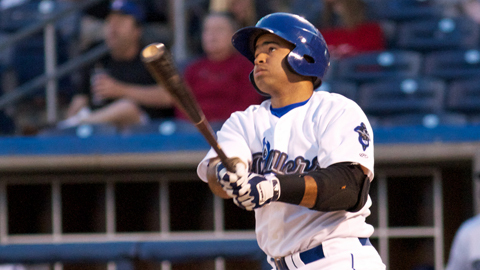 His last home run gave him 32 on the season, tying him for the most in one season in Drillers franchise history. The total also leads the TL. The Drillers currently own a season high six-game winning streak. The Texas League has officially announced that the Tulsa Drillers will host the 2012 U.S. Cellular Texas League All-Star Game at ONEOK Field. The game will feature the North Division All-Stars versus the South Division All-Stars and will be played on Thursday, June 28. Game To Be Played at ONEOK Field on Thursday, June 28 2012. The official logo for the game features a Drillers “T” attached to an iconic oil derrick that recalls Tulsa’s days as the “Oil Capital of the World” and as a longtime member of the historic Texas League. The very first TL All-Star Game was played in 1936, and Tulsa has hosted the event on five previous occasions. The city was the host site in 1962, 1981, 1982, 1990 and 1999. Other activities are planned for the night of the game, including a pair of pre-game home run hitting contests. One will feature the TL’s top hitters, while another will highlight some of the area’s top high school sluggers. The night will conclude with a post-game fireworks display. Drillers Season Ticket holders will have the first opportunity to purchase tickets for the game. Tickets to the general public will go on sale later this year and will range in price from $6 to $16. A number of current and past major league stars have played in Texas League All-Star Games. This list includes: Alex Gordon, Troy Tulowitzki, Hunter Pence, Paul Konerko, Ubaldo Jimenez, Colby Rasmus and Johnny Damon, plus Hall of Famers Dennis Eckersley, Joe Morgan, Willie McCovey and Dizzy Dean. The Tulsa Drillers will conclude the 2011 regular season with a 7-game homestand at ONEOK Field that will begin on Tuesday, August 30 and run through Labor Day on Monday, September 5. The stand will include four games against the Springfield Cardinals (St. Louis Cardinals) followed by three games with the Northwest Arkansas Naturals (Kansas City Royals). The first six games of the set will all begin at 7:05PM. The final game of the regular season on Monday, September 5 will have a special afternoon start time of 1:05PM. The homestand will have one of the best promotional lineups of the season, including Fan Appreciation Weekend that will be highlighted by two separate Fireworks Shows on Friday, September 2 and Sunday, September 4. Other events will include Oktoberfest/Thirsty Thursday on September 1, an appearance by the Phillie Phanatic on September 3 and Fan Appreciation Day for the regular season finale on September 5. A complete list of promotions with descriptions is below. Tickets for all of the games are now on sale at the ONEOK Field Ticket Office at 201 N. Elgin Ave. and at TulsaDrillers.com .Tickets are also available by calling the Ticket Office at (918)744-5901. Season Ticket Redemption:The Drillers are giving season ticket holders a special opportunity to redeem any of their unused tickets during the homestand. Any unused season ticket can be exchanged at the ONEOK Field Ticket Office for a general admission ticket to any game during the homestand, including the two Fireworks Shows. The offer is only good for season tickets. On Home Turf:Tulsa is 6-6 against Springfield at ONEOK Field this year and 5-6 against Northwest Arkansas. Bring Your Bats:Expect plenty of offense in the series with the Cardinals. The two teams have combined to average nearly 12 runs scored per game in 28 previous meetings this year. As a team, the Drillers are hitting .295 against the Redbirds. Tommy Field leads the way with a .396 average and 7 home runs, while Hector Gomez is batting .291 against the Cards with 6 homers. Keeping It Close:If past performance is any indication, you can expect to see close games during the 7-game homestand. Of the 63 games the Drillers have played at ONEOK Field this season, 29 (46%) have been decided by one or two runs. All retired and active members of the United States Armed Forces can receive ½ price general admission tickets at the Stadium Ticket Windows with a proper ID courtesy of BOB FM 92.9. In addition, the Disabled American Veterans (DAV) will give a set of special-edition, Drillers trading cards to the first 500 fans. FAN APPRECIATION WEEKEND – September 1-4!!! Tulsa’s favorite festival comes to ONEOK Field with Oktoberfest Night presented by Z104.5, The Edge! Not only will you be able to work on your “Chicken Dance,” but it is also a Thirsty Thursday with 12 ounce servings of Bud and Bud Light and 21 ounce servings of Pepsi products on sale for only $1 each. Siegi’s bratwursts will be on sale, 2 for the price of 1 and Spaten Beer will be only $2 per serving at the Beer Cart. Live music will be provided by Brandon Clark. Sponsored by Z104.5, The Edge. Our final Friday Night Fireworks promotion now gives you another reason to come downtown – an appearance by Myron Noodleman! Myron will entertain fans during the game with his crazy antics, while after the game, the skies will be filled with fireworks compliments of River Spirit Casino and 98.5 KVOO. NewsChannel 8 presents Grand Slam Saturday and an appearance by the Phillie Phanatic! Not only do the Phillies have one of the best teams in baseball, they have one of the best mascots. The Phanatic will keep everyone laughing with his hilarious routines. In addition, all fans will receive a Drillers 2012 Schedule Magnet when they enter the stadium. Fan Appreciation Weekend concludes with the best promotion lineup of the season presented by 2 News Works For You and K95.5FM. Gates to ONEOK Field will have a special opening time of 5:45PM so fans can meet the Drillers players at a special ½ hour Autograph Session on the concourse. Also, the first 500 kids, ages 12 and under, will receive a Hornsby T-Shirt when they enter as well as an Eat Free Coupon that can be redeemed for a free hot dog, milk and ice cream dessert. The Free T-Shirts will only be available at the Arvest and Oil Derrick entrances. Young fans are also encouraged to wear their bathing suits and enjoy our giant waterspout courtesy of EMSA and the Tulsa Fire Department. Finally, the night will end with a bang as we conduct our final Fireworks Show of the season! The Drillers say thanks to their fans during the final regular season game of 2011. Fans will have the chance to win several great prizes that will be given away courtesy of this year’s sponsors of Drillers Baseball.